The U.S. Women?s Soccer team beat Japan 2 - 1 in the finals of the 2012 London Summer Games. Earlier, the U.S. Women?s Soccer team defeated France, Columbia and Korea DPR for the Group G title, had a (2-0) win over New Zealand in the quarterfinals and a (4-3) win over Canada in the semifinals. After their loss against Japan in the 2011 FIFA Women?s World Cup Final, this is a rematch and victory worth celebrating. Pride, professionalism and a passion for excellence is what drives these amazing athletes and us as CENTURY 21 sales professionals! 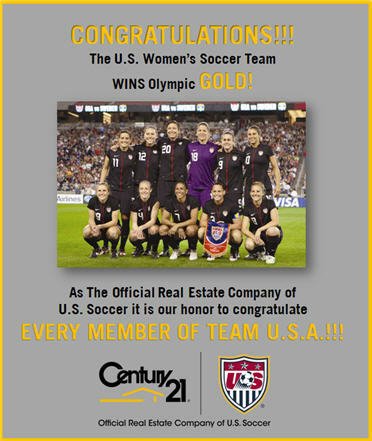 Century 21 Real Estate LLC the franchisor of the world?s largest real estate sales organization, is the official real estate company of U.S. Soccer, including the U.S. Men?s and Women?s National Teams.